Super Lucky Frog is an online video slot machine game from Net Entertainment that has been released in August 2005. This online video slot game has 5 reels and 25 pay lines. The theme of Super Lucky Frog is inspired by the fairy tales of old combined with the classic Japanese cartoon imagery of manga. Online slot players who also happen to love watching anime (Japanese cartoons) admit that they truly liked playing the Super Lucky Frog online slot game. Cute and adorable symbols were used, and most people liked the squirrel symbol because they said it reminds them of the quirky yet warm-hearted Totoro in the Japanese animated fantasy film written by Hayao Miyazaki “My Neighbor Totoro”. Another one of Super Lucky Frog’s best attractions is its triple progressive jackpots, which is carried out on a wheel of fortune type of game. Many online slot players would love to play for free first whenever they come across a new online slot game so that they can find out if they like that game enough to spend real money in it. Thus, whenever they see that a particular online slot game is powered by Net Entertainment, they are certain that they can instantly try to play that game, without the need to download anything! Super Lucky Frog online video slot is an absolute delight to play at, especially for those who love Japanese anime and manga. Super Lucky Frog features a Free Spin Bonus Feature game, a maximum cash jackpot of $15,000, a maximum coin jackpot of 30,000, scatter wins, wild symbols, triple Progressive Jackpots, and last but not least, a 93% payout ratio! Famous for their great quality graphics and absolutely delightful sound effects when it comes to their wide array of online video slot machine games, Net Entertainment has done it once again with the Super Lucky Frog online video slot game. Super Lucky Frog is designed much like what you will see on classic anime (Japanese cartoon) series. The setting is at an enchanted forest where you will find a small cottage beside a peaceful lake. Here you will find many different adorable creatures such as butterflies, big-eyed snails, ladybugs, and magical creatures such as elves, fairies and of course, the crowned frog fairy that is considered the Super Lucky Frog in this slot game. The wild and scatter symbols are often the best animated symbols whenever a winning combination is hit. You will certainly love to stay and play for a while as this game will not strain or hurt your eyes. The overall graphic design of Super Lucky Frog shows many different colors such as green, blue, purple, pink, brown, orange, and red. The background sound effects have been kept to a minimum – you will mostly hear faint animal sounds. Short, anime-like celebratory music will fill your ears whenever you get winning combinations. When you manage to activate the Super Lucky Frog Jackpot Feature game, you will hear “Super Lucky Frog” being called out in a sing-song manner with a Japanese accent, and you will be taken to the Super Lucky Frog Jackpot Feature game for the chance to hit that big Jackpot! There are no card deck symbols available in the Super Lucky Frog online video slot game. The regular symbols that you will find are all related to this slot game’s theme such as the Ladybug, Toadstool, Butterfly, Snail, Unicorn, Troll, Griffin and the Squirrel. The Wild Symbol is the Warrior Elf. It acts as a substitute for all other symbols (except the Scatter symbols) in order to help you complete a winning combination. Multiple Warrior Elf wild symbols that you get on an active payline reward you different prize amounts which can be seen on the Paytable. In Super Lucky Frog, there are 2 Scatter Symbols – the Fairy and the Super Frog Bonus scatter symbols. Scatter symbols mean that they do not need to appear in a line (on an enabled pay line) for you to win. • The Fairy scatter symbol can be scattered anywhere on the 5 reels for you to complete winning combinations, as long as there are 2 or more Fairy scatter symbols that appear. Your winnings are calculated by multiplying the Fairy scatter symbol combination payout (shown in the Paytable) by the total number of coins you’ve bet. If you hit 3 or more Fairy scatter symbols, you will activate the Free Spin Bonus Feature game. • The Super Frog Bonus scatter symbol can be scattered anywhere on the reels, as long as you get 3 or more of these scatter symbols to appear in consecutive order and on an enabled bet line. If you hit 3 or more Super Frog Bonus scatter symbols, you will activate the Super Lucky Frog Bonus Feature game. Do take note that if you get a scatter win and a regular win, you will be paid out for both of them, because the Fairy scatter symbol is not needed to appear on an enabled pay line to win. Scatter rewards are entirely independent from pay line rewards and they are added to the pay line win. The Super Lucky Frog online video slot game has a triple progressive jackpot to grandly reward its loyal players! A progressive jackpot is described as a continuously-accumulating prize, and the most recent values of the 3 Progressive Jackpots are showcased in the Super Lucky Frog slot game. In order for you to be eligible for the Progressive Jackpot, you must bet a maximum of 4 coins on all 25 bet lines (totaling to 100 coins) per spin. Every time a player plays the Super Lucky Frog slot machine game, a portion of their bet is added to the Jackpot prize. Do take note that the probability to win one of the bigger Progressive Jackpots increases with the size of your total bet in the game round. The Super Lucky Frog Jackpot Feature will be activated when there are 3 or more Super Frog Bonus symbols that appear on an active pay line and in consecutive order. Note #1: The Progressive Jackpots are available in free and real play mode, but with totally separate funds. Note #2: The Progressive Jackpot counter may be shown in a currency other than the one you are playing in. In case you have won a Progressive Jackpot and you are playing online casino games with a different currency, the amount you have won is converted to the currency you have been playing and it is therefore included to your account. Note #3: The ones who are eligible to win the real money Progressive Jackpot are Real Money players only. The first Bonus Feature game is the standard one, a Free Spin Bonus Feature game. It is triggered when you hit 3 or more Scatter Symbols (Fairy) that are scattered anywhere on the 5 reels. If you hit 3 Scatter Symbols (Fairy), you will be rewarded 10 Free Spins; if you hit 4, you will be rewarded 20; and if you hit 5, you will be rewarded 30 Free Spins! All of the winning combinations that you hit during the Free Spin games are tripled! Another great thing about their Free Spin Bonus Feature game is that if you manage to hit another 3 or more Scatter Symbols (Fairy) while playing the Free Spin game, you are rewarded another set of 10, 20, or 30 Free Spins! The extra Free Spins you get are then added to the remaining number of Free Spins. During the Free Spin Bonus Feature game, you can be awarded an infinite number of additional free spins! When the Free Spin Bonus game is over, you are then taken back to the regular Super Lucky Frog slot game, and all of your Free Spin game wins are added to your total win. The second one is the Super Lucky Frog Jackpot game. It is triggered when you simultaneously get 3 or more Super Frog Bonus (scatter symbols) which can be scattered anywhere in consecutive order and on an enabled pay line. 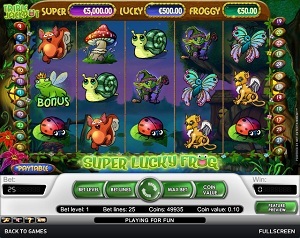 The amounts of the Progressive Jackpot are displayed at the top portion of the Super Lucky Frog online video slot game screen. While on the Super Lucky Frog Jackpot Feature game, simply click the Spin button to begin the Jackpot Wheel spinning. The Super Lucky Frog Jackpot Feature game will end when a bonus prize or the progressive jackpot is given. Keep in mind that the possibility to win one of the bigger jackpots will only increase with the size of your total bet in the game round that triggered the Jackpot game. The Progressive Jackpots are available in both free and real play mode, but with separate funds. When the Super Lucky Frog Jackpot Feature game is over, you are then taken back to the regular Super Lucky Frog slot game and your bonus game wins are included to your total balance. Do take note that the Super Lucky Frog Jackpot Feature game can be activated even if you are currently playing the Free Spin Bonus games; however, the Free Spin multiplier does not multiply the winnings that you will win when you are playing the Super Lucky Frog Jackpot Feature game. Super Lucky Frog has 5 reels where you may bet on as many as 25 pay lines. The minimum bet is 0.01 and the maximum bet is 0.50. You may wager from 1 up to 4 coins per line. It is absolutely more fun and easy when there is an Autoplay function available in online slot games. In Super Lucky Frog, you can access their Autoplay function by clicking on the Autoplay button on the lower left corner of the screen. Super Lucky Frog can be automatically played as complex or as simple as you would want it to be. In its simple settings, you can choose from 10 to 1000 – these are the number of spins that the game can automatically play for you. If you would like to use a more complex Autoplay setting, just click on the Advanced Settings button and choose to Stop Autoplay when: you win, if Free Spins is won, if Bonus Game is won, if a single win exceeds an amount you specify, or if your cash decreases or increases by an amount your specify. When you are completely satisfied with customizing your Advanced Settings, just click on the Start button and the Autoplay function will automatically help to spin the reels for you.